!! Goddamn kids these days. Starting from today, daily updates until the end of the chapter! So come back tomorrow (and the day after) (etc). Oh, hello there, Peter Pan ! Soli appears a bit… nonplussed about having to deal with My First Crime Syndicate. Yay! I’m glad your posting again, twas worth waiting! 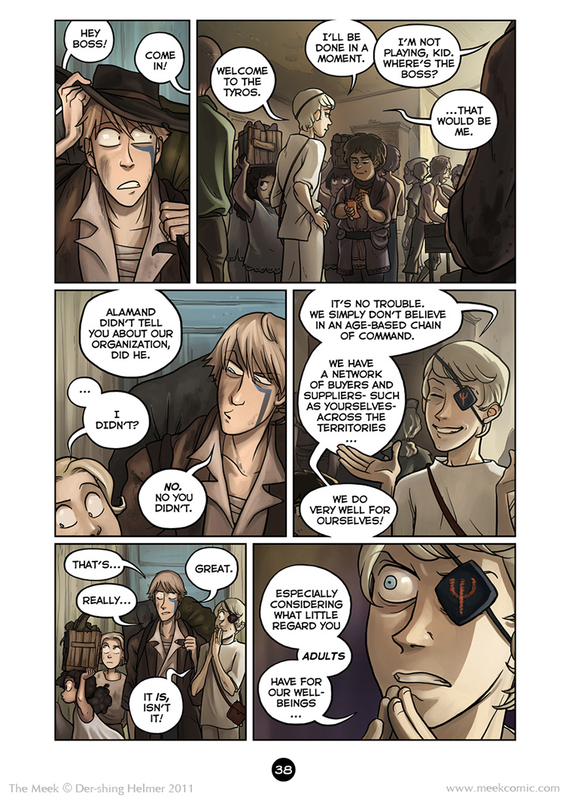 see right now I’m fighting the urge to call the new guy eyeball kid ; ; hahahaa, the second-to-last panel. and then the last panel. He terrifies me. Haha, I am still working on them (I decided to do them in inking rounds/ coloring rounds this time)… I think I can pull off a page a day till next weekend though, I have a lot done from each page right now. But yeah! Enjoy! OMIGOD I LOVE THIS KID ALREADY. Who could not love an eye-patched child who steeples his fingers? Seriously! My prediction for the next page is that he goes into a monologue about organization philosophies illustrated by fighting fish a la from Russia with Love. Oh I am so happy that you have updated again!! I wonder how bosskid lost his eye? Yaaay, and the shading got a bit more painterly! Yeah, I rediscovered the technique I used in Chapter 1 ;u; I lost my way in Ch 2… I like this way a lot more. This page was well worth the wait. Yep, that kid is a regular Peter Pan. Yay update! It is excellent as always. Except why does the kid on the page before this have his head shaved but the rest don’t? Hair is sort of a “thing,” who gets kids these days. YES! I was afraid this story was gone the way of the buffalo for a second! Welcome back! Thanks! I will never go away unless I die. Have to hiatus sometimes, but will never go away. OMG OMG that last pannel. So Emilio Largo. Great to see you back! Hope all your professional endeavors are working out! SOGUD. Great Job Ms. Helmer! I feel like the “underground black market of munchkins” is going to involve Hyla somehow. Considering what we now know, I think insight has been given to the context of the passwords. Missed your strip! Thanks for finding time to update! If you werent such a durned good story teller…. but then again, you are, so there you have it! It’s like Peter Pan stole Captain Hook’s eyepatch. Ahhhh, I love this kid’s eyepatch look. :D What a fantastic character and that last panel is just KILLER. Haha, trying to get my groove back. After this will still be daily (with the sketch pages), then we’ll get into Ch 4. Soli + Hat-hair = Adorable. Reminds me of what my hair looked like throughout the entire 6th grade. 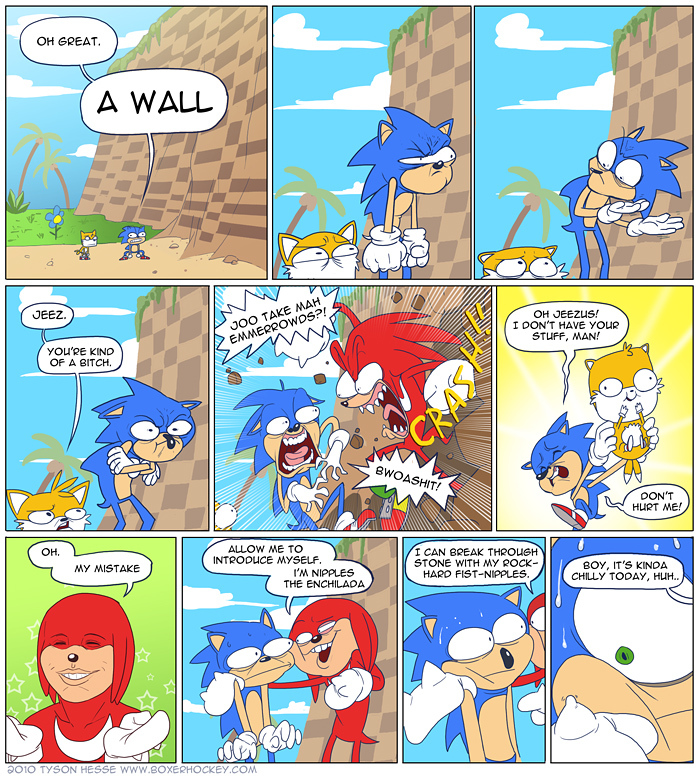 Ahaha, that last panel is so perfect. I like the Boss already. That was the first thing I thought of too. I wasn’t brave enough to share it though. God bless. Yay! So good to have you back. Soli looks nice and rested. Oh! That mark on his eyepatch looks familiar! On the wall from a few pages ago, if I’m not mistaken. Interesting that the kid is Carissi… Can’t wait to see where this goes! On another note, SQUEEEEE. Soli looks so hot in that 3rd panel. Glad to have you back! It was worth the wait! Who is this kid, I freaking love him! Smile, smile, smile, EEEEVIL. Hurray! Glad to see new updates! Daily updates! Woooo!!! Can’t wait to see how this chapter goes. Also, It might just be me, since it’s very hard to get a clear picture of his left hand, but is he missing his ring finger? I can’t see it very well on the second-to-last panel and it’s not there in the last panel. Ooh, I didn’t think anyone would notice until the next page C: Good eye! Making a “kid power” characters or setting is usually pretty dicey for media not aimed at that demographic. Either you end up with an awkwardly childish tone or children that are indistinguishable from adults. But here, especially with the last panel, I think you’ve walked that fine line while developing an interesting character. I look forward to see where this goes. I like having a lot of kid characters in my stuff, not really thinking about demographics as much as just how easy it is to dismiss kids… they are sort of like little adults, but without very well-developed morality! IMHO anyways. I think it’s interesting. …so I was reading this before a flight, wondering when it’s going to be updated, and when I check after the flight it has been? It’s possible! I don’t play games and have never seen Quake (but it’s not a terribly creative symbol either). You could also say it’s a trident, and as such a symbol for the gods Neptune/Poseidon and/or Shiva. but for some reason I’m betting it’s something completely different. Wow! This makes me happier than it probably healthily should! Thanks a lot for being so creative. I fell of my couch and onto my cat when I saw the update. For a kid he seems to be very aged, his eyes seem like they’ve seen more experience then a kid should have. Children of that age have neither the foresight, wisdom nor intelligence for the long-term planning required of an international criminal syndicate. Possibly! You’re only seeing one side of it, so. THE MEEK IS BACK!! OMG IT MADE MY DAY!!!! I’ll be there! I can’t wait till tomorrow! FINALLY daily updates?! SWEET! Happy Birthday to your ma. Kid is maybe a little unbalanced. Hm. How old is the boss? 14? 15? Could even be a slightly built 16. Yep, he’s 15! I like to think he’s paranoid of looking older (though given his build it’s probably not going to be a dramatic change). Time to add you to my RSS feed I guess..
New pages – so excited! I really enjoy how much is conveyed about this Boss fella in just four panels. I can imagine his mannerisms and the way he moves very clearly. About today’s page… I’m not sure if I like that guy or he’s creepy. Even if I like eerie things. Showed up on my RSS ok :shrug:. Maybe try deleting the feed from your reader and re-adding it? I’ve had a few problems with Google Reader that were fixed doing that. This makes me so happy. Thank you so much for updating, this is lovely! The lighting in the last panel is so sinister! I dig it. Gosh yes, I’ve been hoping for this to happen! Thank you, on behalf of ABSOLUTELY EVERYONE for committing to daily updates, too. I won’t hold you to it! Also I love this page. If I had to describe your art style in one word that word would be “communicative”. ‘Cuz it is. So taking that last pic for a Bond moment. Wow, Back to Back updates! That’s getting S**t done! Also, I screamed with joy when I saw this update. Wow, I check The Meek expecting nothing, and I find four new updates! Yay!! Such is the way of the elusive wild webcomic creator. OMFG!!!!!!!!! I saw you updated and I got so hyper I ran against a wall, hopped on and off my couch and started crying. OH HAPPY DAY! The Kids Next Door is REAL! Wow. I was rereading the chapter, and with the higher-res images you can make out the stitching on the eyepatch in the last panel. (And also a little bit in the fourth) A very nice touch. A lot of times in art, you can see fabrics that are decorated with embroidery or whatever, but here, you can really see it. But I also understand why people don’t detail it most of the time. Even a simple symbol probably took decent time investment for such a small area. That kid went from 0 to 100 real quick there.